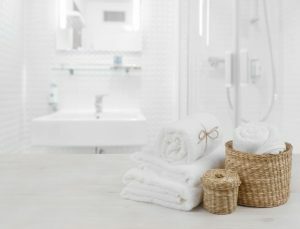 When it comes to enhancing the functionality and safety of your home, the bathroom is often overlooked. With slippery and hard surfaces, it is one of the most high-risk places in the house. Since the bathroom is used frequently throughout the day, it’s important to minimize the potential for accidents. Review the following tips to ensure your bathroom is a safe environment. Appropriate lighting is extremely helpful in compact spaces like bathrooms. Accidents often happen in the dark, as one can easily slip and fall on unseen obstacles. Install a light that illuminates the entire bathroom, and be sure to use anti-glare lightbulbs. It’s recommended to use a low-wattage light source that either stays on all night or is motion-sensitive to help guide you during any middle-of-the-night visits. Wet surfaces or mold may also go unnoticed in dimly lit rooms. Sufficient lighting in the shower or vanity lights over the sink can help expose those unwanted risks. If you want to maximize the brightness in your bathroom, try mounting fixtures on either side of the mirror. The reflection can give the room more natural brightness, and will also eliminate shadows of your own reflection. It is critical to make sure that your flooring and décor is safe for your bathroom. Falls often occur while getting in and out of the shower. To avoid tripping or slipping on bathroom rugs or mats, only use rubber-backed coverings that stay firmly in place, or secure them with double-sided rug tape or rubber carpet mesh. Using a towel at the base of your shower or tub to step onto is unsafe—it can easily slide away from underneath your feet. Consider placing nonslip rugs wherever water can easily spill—in front of the shower or tub, toilet, and vanity. If balance is a concern, you are not alone. In the bathroom, there are many things you can do to help yourself stay steady. For more stability in the shower or tub, install a grab bar to help keep your balance when stepping in and out. Get assistance if needed to securely install the grab bar so that it properly supports the required weight. Transfer benches or shower chairs may also be helpful for maneuvering in and out of the wash area. Plus, both of these tools provide seating support for those who have difficulty standing for long periods. Be sure to choose one with rubber-tipped legs to help prevent sliding, especially when the water is running. A few common safety concerns for using the bathroom are mobility, strength, and balance. For those who may have difficulty rising from and lowering down to the toilet, a raised toilet seat can help. Elevating the seat just a few inches can greatly reduce the amount of effort required to sit and stand safely. Additionally, installing grab bars or safety rails on the side of the toilet or wall can help provide support and a sturdy grip. These bathroom safety tips are important for your health and overall well-being. Consider how you can make each improvement work in your home … living safer and worry-free will be worth the effort.